Anchan and Shuka woke up later that evening only to be greeted by the seven members of Aqours in their sleeping attire. Aiai, King and Aikyan were totally hooked on their Psp&apos;s playing Monster Hunter 3. Aina was busy drying her hair with the help of Suwawa. Arisha and Rikyako were playing cards. "What time is it?" Anchan asked while rubbing the sleepiness off of her eyes. "We&apos;ll go tomorrow" Anchan said as she herself got up and gave Shuka a peck on the cheek before proceeding to go to her travel bag and getting some clothes out. "Where are you going?" Shuka asked, the sleepiness completely gone. "Wait for meeee!" Shuka quickly got her own clothes and followed Anchan. "Just like how those two can&apos;t get off of each other too" before gesturing towards Aina and Suwawa&apos;s way. Due to sleeping from morning till late afternoon, Anchan couldn&apos;t quite sleep. The others already went to bed, and so did Shuka. Boy, can that girl sleep. Anchan smiled at her sleeping members and went out of their room. For some reason Anchan found her way towards the 2nd floor balcony of the inn they were staying at. Somehow, the cool air that touched her face was somewhat nostalgic. She thought about how her life was before she even started on her acting career and other things like that. Anchan was leaning on the railing of the balcony, hands rested on top of it and eyes closed while savoring each moment. She&apos;ll go to sleep once her body is ready to give in to sleep. Right now, Anchan just needed to have her alone time. That&apos;s what she thought anyway, until a hot sensation came across her right cheek which startled the poor girl. Anchan turned her attention to where it came from and saw Saito Shuka holding out a can of hot chocolate while smiling. "Hey" Shuka&apos;s sleepy voice echoed in Anchan&apos;s ears. Anchan took the can and gave Shuka a nod as thanks before proceeding to look at the view beyond the balcony. "Just thinking about some stuff I guess" with another shrug. "Like what?" Shuka asked, not taking her eyes off of Anchan and not letting her hand go. "Like how I used to be before I became an actress, before I became part of Aqours, before all of this" Anchan started. Shuka didn&apos;t say anything which was Anchan&apos;s cue to continue. "I still remember those moments wherein taking the acting career was just merely a dream. But now that Im actually here, it still feels like this is all a dream, I still ask myself if the current Anju that&apos;s here, is she real? Is she being her real self? Is this real?" Anchan continued, not looking at Shuka once but Shuka cupped Anchan&apos;s cheeks and made her look at her. Anchan saw the seriousness in Shuka&apos;s face that she just did nothing but face her in silent, not daring to make any sound. 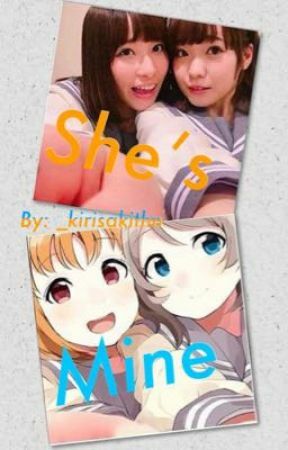 "That&apos;s too corny Anju" With a last giggle, Shuka then pressed her lips with Anchan&apos;s.
After they parted, the two of them continued to watch the view, with Shuka&apos;s head resting on Anchan&apos;s shoulder and Anchan&apos;s hand around her waist.